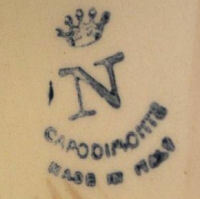 Chief modeler at the original Capodimonte Royal Factory between 1743 and 1759. 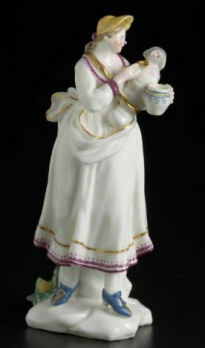 Gricci, a Florence-trained sculptor, was the chief modeler for the Capodimonte Royal Factory until its closure in 1759. 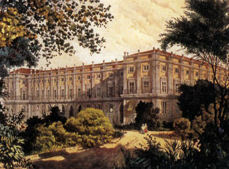 When King Charles VII of Naples became King Charles of Spain and moved Capodimonte production to Buen Retiro, (near Madrid), Gricci moved with it and became the chief modeller of the Spanish factory until his death in 1770. 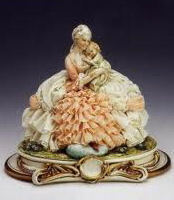 Surviving factory records indicate that he was responsible for almost all of the early soft-paste Capodimonte porcelain figurines produced during the factory’s operation in Naples. Records also indicate that the master painter Giuseppe Della Torre, and carver Ambrogio Di Giorgio formed Gricci’s original team. By 1755 factory production was at a point where the chief modeller had perhaps as many as six other modellers working under him. 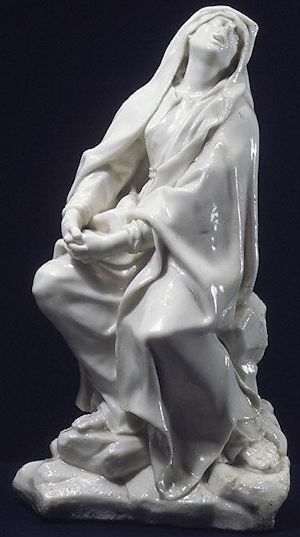 He is also credited with designing a popular snuff-box molded in relief with shells and marine life, and the creation of spectacular porcelain cabinets made with interlocking plates of porcelain decorated with chinoiseries. 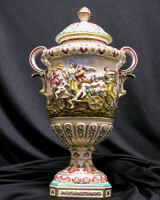 (Chinese artistic influences – fanciful, ornate and idyllic imagery) One, the Salottino di Porcellana, while in Naples, and another, the Gabinete de la Porcelana, while in Buen Retiro, Spain. 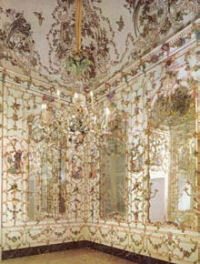 The room decorations were a combination of the same type of tiles he used to create the porcelain cabinets mentioned above – with the same chinoiseries, and decorative floral, vines, and sconce pieces. 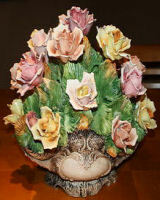 It also includes Capodimonte-made chandeliers – of course. *This room was later moved to the National Galleries at Capodimonte in 1866. 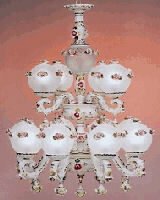 **He created a similar rooms for the King’s two palaces in Spain. It is generally accepted that The Mourning Virgin, (The Mater Dolorosa), figurine is the only remaining Gricci piece that has his signature.